This is the contents of an old website www.prefabsareforpeople.org.uk. 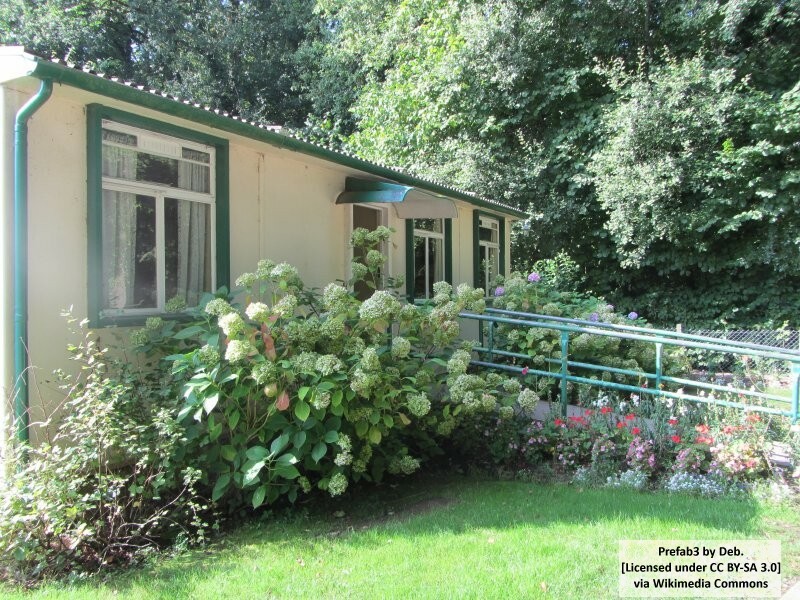 Welcome to www.prefabsareforpeople.org, started 21st March 2004. Here is an initial statement of the objectives of www.prefabsareforpeople.org.uk. It is a great tribute to the original design and building of these houses that, although intended to last for only 10 years, nearly 60 years later their residents are still happy in them. An area of mid-1940s prefabs originally built with a five-year life span. The Committee was informed that these houses remained very popular with elderly residents. But what how much will the compensation be for the loss of good friends and neighbours and a “Sustainable Community”. Hunslet Grange or Leek Street Flats was a system built flat and maisonette complex built in South Leeds in 1968. It outline design was developed by the Yorkshire Development Group which was design and sponsoring consortium created by Leeds, Sheffield, Nottingham and Hull local authorities. Hunslet Grange was the largest single complex (of about 2,500 units) of an initial order placed in 1966 with Shepherd Construction of York for about 4,500 units. This was at the time the largest single order placed with a one builder for social housing. In common with other system built blocks Hunslet Grange developed problems with structural stability and water penetration leading to damp and condensation and prohibitively high fuel costs for tenants. Following a series of residents’ campaigns the complex was demolished in 1983. Even developments of multistorey blocks less troubled by construction problems have been given up as a bad job. The last remaining symbol of Chalkhill Housing Estate came tumbling down on 24 July 2002, when the Leader of the Council, Ann John pressed the button. The design of the walkway blocks was based on that of Park Hill in Sheffield and was built in several phases between 1966 and 1970. In 1980’s, widespread concern about the conditions on the estate led to a number of initiatives that included door entry systems and walkway closures. These were implemented in three phases from 1987 and were funded through the government’s ‘Estate Action’ programme. Evidence based planning? Any research on the social environment of prefabs? A small prize. It would seem sensible that planners, in the field of housing especially, would be interested to know which forms of housing had happy residents and which did not. PrefabsAreForPeople is offering a prize of a bottle of Bollinger to any planner (or architect) who can show there is some good quantitive research on the social environment of housing forms, especially prefabs. Is the government warming to prefabs? Deputy Prime Minister John Prescott told 1,600 delegates at last week’s Urban Summit, that all future housing developments in the South East would have to build to at least 30 homes per hectare from now on. The average for the region is currently 20 per hectare, compared to more than 50 in Islington, 80 in Greenwich Millennium Village, 250 in Edinburgh and 400 in Barcelona. He said the UK should strive to match America and Europe in producing prefabs and should be aiming to give people a good quality of life, rather than just think about building houses. Sprawling, land-wasting housing estates2 are a problem everywhere, both in town and country, said its policy director Neil Sinden. Sad to say the ODPM’s interest in prefabrication seems not to be a recognition of the success of the prefabs of the 1940’s (or even Walter Segal’s elegant designs) but for high-density “prefab flats” – reminiscent of the horrors of the flats built in the sixties and seventies which were knocked down in disgust in the eighties and nineties. 2 “Sprawling, land-wasting housing estates” are not always the problem. As Dr Keith Porter of English Nature said at the British Association last year, low-density developments with gardens and public open spaces would provide more favorable habitats for species than the giant pesticide-treated cereal fields that dominate much of the countryside now. Greening the greenbelt explores these issues.